Prosoft’s Data Rescue programs have been among the go-to applications for data recovery. If you had a hard drive you needed data from, and it was in semi-functional shape, capable of mounting to some degree and not making terrible grinding noises, there’s always been a good chance you can run a Data Rescue program across it for however many hours, days, or weeks that the process required and get some of your data back, including deleted files. As of now, the old standby is now arriving in a Data Rescue One format, which bundles both the Data Rescue 4 application with a 16GB USB thumb drive or a 500GB or 1TB external USB hard drive to save recovered data. The storage device has three partitions: Prepare Data Rescue, Data Rescue One, and Data Rescue Storage. When you connect the Data Rescue One drive, you can either run the Data Rescue One application from the Prepare Data Rescue partition to boot into the Prepared Data Rescue partition, or you reboot, hold down the Option key and choose the Prepare Data Rescue partition to boot into. After booting from the Prepare Data Rescue partition, the computer will run low-level setup code, make the Data Rescue One partition a bootable volume and you’ll be on your way. 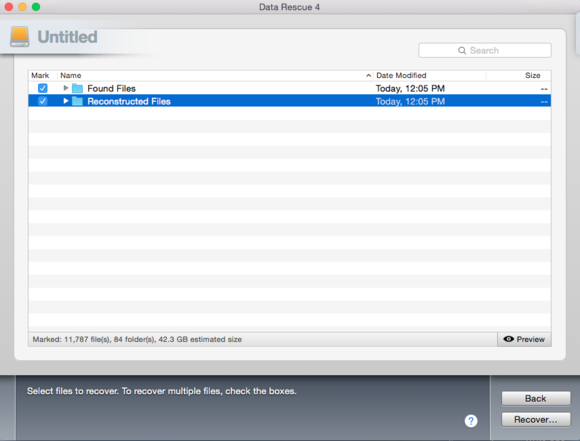 For fans of the Data Rescue series, Data Rescue One has the Data Rescue 4.2.1 application you know and love, complete with its familiar bells and whistles. The application still lets you choose what function you wish to perform with your drive (Quick Scan, Deep Scan, Deleted Files Scan, Clone, etc.) as well as includes expert features for working with RAID configurations, managing your past drive scans, block level tools, and the absolutely-indispensable warning feature that tells you when your hard drive is having mechanical slowdowns or may be near the end of its life. That’s the good news and during testing, Data Rescue One was able to grind away on fully and semi-functional drives, recovering both existing and previously deleted files from HFS, HFS+ and NTFS-formatted drives. The bad news came in the form of a crash during a data recovery wherein the Data Rescue One application froze in the middle of its process, refusing to continue after the MacBook Pro it was running on was awoken from sleep. Attempts to boot into the Data Rescue One partitions were met with either a freeze on boot or error 1101. It was at this point that I contacted Prosoft’s tech support, found I needed to boot back into OS X, reformat the Data Rescue One partition with Disk Utility, set it up again with the Prepare Data Rescue Partition and run the test again. The program worked without incident after that and Prosoft said it’s working on a fix in the near future. While the crash and error were surprising, they come on the heels of Apple’s only recently releasing OS X 10.11 El Capitan, which changed the ground rules as to which partitions can be booted from and under what circumstances. Apple has tightened this up and under OS X 10.11 El Capitan, it’s impossible to, at present, use Data Rescue One’s command to easily create a BootWell drive and boot into it. At present, if you’re running Data Rescue One under OS X 10.11 El Capitan, you’ll be booting into specific partitions via the option-boot feature on your Mac, so get used to this idea until a patch comes out to sort through this new parameter set into place by Apple. 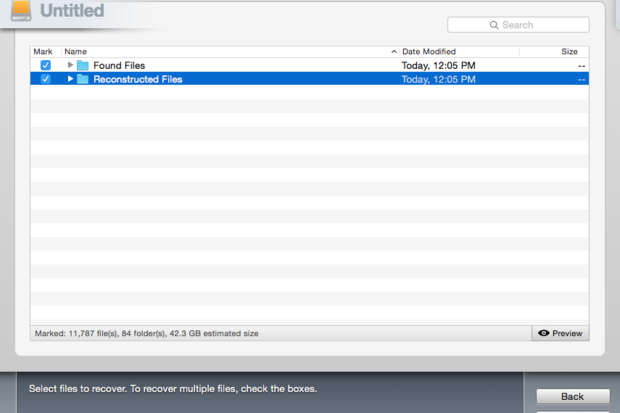 Even with this bug and small catastrophe, Data Rescue One came through with flying colors. Prosoft’s tech support got back to me almost immediately via email with the fix as to how to use Disk Utility to format the Data Rescue One partition and I was able to get back to working with my test drives posthaste. 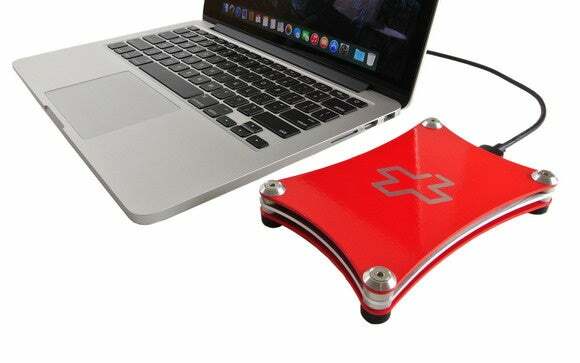 Data Rescue One is a tough data recovery kit; it’s nice to have a storage device for immediate data recovery. One could argue that there should have been better communication between Apple and Prosoft over OS X 10.11 El Capitan functionality at this point, but at the end of the day, I was able to leave Data Rescue One to harvest data from failing hard drives.